I’m writing a series of articles about cancer. This subject is scary to everyone, but the more you know about it, the safer you are. Almost every week I see someone who has had cancer or pre-cancer previously, and now is all better and back to normal. There has been tremendous progress in the detection of many types of cancer, and the treatment of them is much improved over what it used to be. Someone once told me the job of an ObGyn is to check every patient for cancer. When I see patients I always think of that. I’m going to write about it so the knowledge can make you safer. I have to say, though, that this blog is not intended as specific medical advice for your particular condition. If you have concerns about cancer, you should see a professional about it. 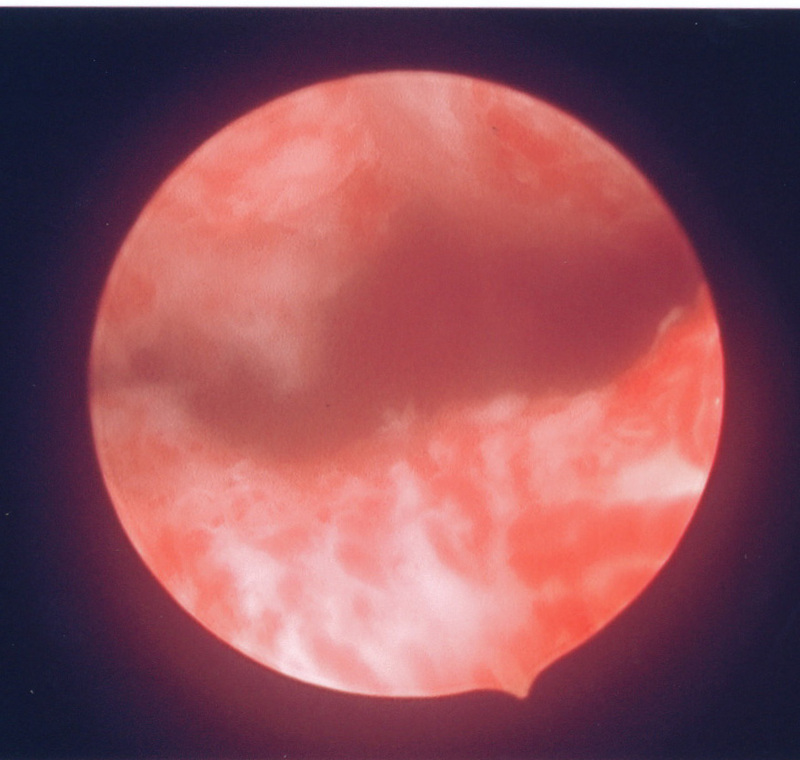 A view of the inside of the uterus as seen through a hysteroscope. Today’s topic is Detecting and Treating Cancer of the Uterus. Normal healthy cells that make up the body’s tissues grow and replace themselves regularly, keeping you strong. Sometimes abnormal cells develop that can grown at a faster than normal rate. These cells can be a pre-cancer or a cancer. In the uterus there are different types of cells and different types of cancers. The most common type is endometrial cancer. Endometrial cancer affects the endometrium, the lining of the uterus, which normally is shed every month as a period. There are also rare tumors of the uterine muscle called sarcomas, but we will focus here on the more common cancers. Endometrial cancer is the most common type of gynecologic cancer in the United States, and about 2-3% of women will develop it during their lifetimes. It is rare in women under age 40, and most frequent in women around age 60. Risk factors for it include: obesity, irregular menstrual periods, infertility, starting periods early (before age 12) or having menopause late, history of other cancers, use of Tamoxifen, positive family history, smoking, medical problems including diabetes and high blood pressure, and other risks related to hormone use. Symptoms of endometrial cancer are related to abnormal bleeding. This can take place in different ways, but usually involve heavy bleeding, spotting or bleeding in-between periods, periods that last for a long time, or any bleeding after menopause. If you suspect that your menstrual bleeding is not normal please tell us about it! We can detect cancer of the uterus in many ways. There are no screening tests for it. A pap test is NOT a good test to diagnose it. A vaginal ultrasound can also be helpful in evaluating the uterus but does not yield a definite result. But many tests are available to detect abnormal cells, and the tests are safe, accurate and reliable. To detect cancer (or pre-cancer) of the uterus we need to obtain a sample of tissue from within the uterus, as that’s where the bleeding is coming from. This can be obtained by a biopsy, or by a hysteroscopy with a D and C. The endometrial biopsy can obtain tissue from the uterus by using a small plastic tube and inserting it into the uterine cavity. This procedure causes some pain so it is usually not the best choice if good anesthesia is available. A D and C with Hysteroscopy is a way of using a slender light-transmitting scope to look inside the uterus, and then tissue is gently scraped out and sent for analysis. This procedure is done with anesthesia and is very accurate for diagnosing cancer or tissue that can lead to it (pre-cancer). As a hysteroscopy with D and C is very thorough and reliable, we utilize it frequently in finding out if any cancer or pre-cancer is present. In most cases evaluation will yield normal results and we reassure the patient that no further testing or treatment is needed. Sometimes we find an abnormal result, and then we sit down and talk about all of the choices that are available for treatment, both medical and surgical. There are many treatments for pre-cancer and cancer of the uterus. They work very well. Pre-cancer can be treated medically with progesterone. The usual choice for this is called Depo Provera. It is given as one injection that lasts for 3 months and then is repeated. After six months the D and C testing is repeated and we usually find that the tissue has returned to normal. Cancer of the uterus is usually treated by surgery. A hysterectomy is done that removes the uterus with both tubes and ovaries. In addition, during the surgery a staging is done to determine if there is any spread of the cancer beyond the uterus, and if any additional treatment such as radiation or chemotherapy should be used. In most early cases a cure can be expected. With Stage 1 disease 85-90% of women will have no sign of cancer 5 or more years after treatment. More advanced disease has a smaller chance of cure, so finding out if cancer is present as soon as possible is always important. I hope that this information has been helpful to you in understanding the symptoms of cancer, how we detect and how we treat it. If pre-cancer is found the cure rate approaches 100%. If early cancer is found, it can be cured the great majority of the time. There are frequent advances in this field that help us detect and treat cancer, increasing our likelihood for a complete cure. If you have concerns about the possibility of cancer, please let us know. Our goal is to detect and cure it as soon as we can. This entry was posted in Our Office and tagged American Congress of Obstetricians and Gynecologists, Cancer, Depo Provera, Endometrial cancer, Menstrual cycle, Obstetrics and gynaecology, Uterine cancer. Bookmark the permalink.